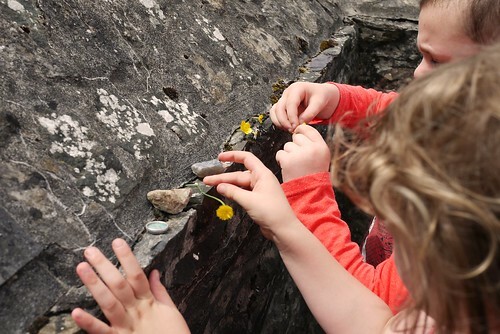 Alongside prayer, offerings can be thought of as being one of the most fundamental cornerstones of Gaelic Polytheist practice. They can be an act of devotion, a way of showing our respect and gratitude, a simple way of saying hello… They are a way for us to build and maintain a relationship with the gods, spirits and ancestors. Arguably the most common or “everyday” types of offerings that Gaelic Polytheists make are food or drink. Traditional examples include libations of milk, cheese or butter, bannocks, or bread. Non-food-stuffs such as flowers, items of jewellery or artwork etc. may be given as well, of course (see here for an overview). Certain occasions, such as festivals or rites of passage, may have certain types of offerings closely associated with them, which may influence your choice of offerings (at Lùnastal, for example, you might wish to make an offering of the first fruits, since that’s a major theme of the festival). Of course, there’s no absolute need to stick to traditional offerings at all times – if you want to offer a bit of pizza or chocolate cake, why not! The main thing here is, trust your instincts: if you think it will be well-received, it probably will be. Whatever you choose to offer, though, at the very least you should make sure that it’s safe for local wildlife and the environment – killing trees or animals (etc.) would undermine what you’re doing here. You also want to be sure that your choice of offerings won’t offend local spirits (or attract ones you’d really rather not deal with), or offend local beliefs and practices. This is especially important if you happen to live outside of the Gaelic homelands; different places have different spirits as well as different ceremonial protocols. What may be perfectly acceptable in Scotland or Ireland or Man may not be elsewhere, so just be mindful. The number one issue here is alcohol. If you live in North America, do not pour alcohol on the ground. If you absolutely must offer alcohol, it’s better to allow it to evaporate or burn it (though even then, be careful, and be considerate).1 The reasons for this prohibition against alcohol are many, but a big one is that alcohol offerings can attract spirits you really don’t want to be dealing with. This is a matter of your own safety as much as it’s a matter of respect and honour to the people, the land, and the spirits who you’re sharing space with. Likewise, if you live outside the Gaelic homelands there often seems to be the temptation to make offerings that people think would be well-received by indigenous spirits. Don’t do this… Really. No matter how well-intentioned your reasoning, there is a lot of misinformation and ignorance out there, so more often than not, people end up doing something they think is respectful and authentic when it’s not. If you are a Gaelic Polytheist, be a Gaelic Polytheist. Make offerings that are based in your tradition, and which are compatible with the traditions of the place you’re practising in. Who Should I Make My Offerings To? That really depends on a number of things, though mainly it’s a matter of who you think you should make offerings to. Some people prefer to make offerings to specific deities they have a relationship with, others prefer to keep things more general and offer to the gods, spirits, and ancestors as a whole. The latter approach can be useful if you’re just not sure, but you feel the need to do something. Sometimes circumstances or the occasion might influence your choice of who you’re offering to – if you’re observing Là na Caillich, for example, you’ll probably want to make an offering to the Cailleach, while if you’ve just moved to a new area, it’s a good idea to make offerings to the local spirits, etc. Sometimes the main influence in who you offer to might be your mood, or something more personal. You might find your approach and focus changes over time, too, so keep an open mind. As a beginner, if you’re really not sure then the best approach might be to start out addressing the gods, spirits, and ancestors more generally, and then get more specific (if you feel you should) as you find your feet. Generally speaking you don’t have to offer a huge amount; the question of “how much” really depends on how much you feel is appropriate. Trust your intuition. For special occasions you might want to offer something “more” than you usually do, but over all your offerings don’t have to be huge, expensive, or extravagant. Your offerings should always be within your means. How Often Should I Make Offerings? Everybody is different and has different needs. Some people like to make small offerings on a daily basis, as part of their daily practice, while others might prefer to make them on a weekly basis, or perhaps somewhere in between. As a general rule, offerings are always a part of our more formal ceremonial occasions like festivals, rites of passage, and regular observances such as greeting the new moon. Besides that, it’s up to you. Where Should I Make My Offerings? As part of a regular practice, a lot of Gaelic Polytheists like to set up a shrine or altar in their homes, which can be used as a focal point for their rites and ceremonies. This can include a space where you can put offerings, and it can be indoors or outdoors, or both. For example, some people like to maintain multiple shrines in their home, each with a different purpose or focus, so any offerings would be made at the appropriate shrine depending on who they’re for (ancestor offerings would go on the ancestors’ shrine, etc.). I have a shrine in my kitchen and occasionally make my offerings there, but personally I prefer to make my offerings outside when I can, since they’ll end up there anyway. As part of the space I’ve set up outside for my spiritual observances and devotions, I have a couple of bird feeders (one that hangs from a bracket, and one that’s essentially a small shelf, facing west towards the ancestors). I put my offerings on them to keep them out of my pets’ reach. Offerings aren’t just (or only) made as part of your regular practice at home, however. When we go out we might enjoy a visit to a local woods, a forest, a beach, or a river (and so on), or we might choose to visit sacred places – holy wells, clootie trees, etc. As we get to know an area, there might be some places we like to visit because they bring us a sense of connection to certain deities (going to the sea brings a feeling of Manannán being closer, perhaps) or bring us closer to our spirituality in general. While we are there, it might be nice to show our appreciation and leave an offering before coming home; again, considerations for the environment and local wildlife should always be at the forefront of what we leave behind. Likewise, when we collect something from a place (always ask permission from the spirits, first) – bits of wood for charms, picking berries, finding mare stones, etc. – we should always leave a token of our gratitude in the form of an offering. It can be handy to carry some simple offerings with you (nuts are a good go-to, if you don’t have allergies, seeing as they have a long shelf-life). What Should I Do With My Offerings Once I’ve Made Them? In Gaelic tradition, once an offering is made its toradh is taken. Toradh is essentially the spiritual essence or goodness of the item being offered, and it’s said that to consume something after its toradh has been taken can be harmful. As such, once an offering is made it should never be “taken back” or eaten by a person (or, ideally, a pet). Since wild animals may often appear as avatars of deities or spirits, there is not so much of a concern if they are consumed by wildlife. The outline here is written with the beginner in mind, if you’re looking for a starting point in terms of reaching out to the gods, spirits, and ancestors… This, of course, is just a suggestion, and you might prefer to make your offerings to someone specific, or keep your devotions to the gods, spirits, and ancestors separate. Whatever works for you. You may prefer a different approach, and there’s nothing wrong with that; if you’re looking for something more formal, then you could try looking at The Deiseal Ritual. First of all you need to decide what you’re going to offer, and who you’re going to make your offering to. Once you have your offering at the ready and you know who you’re going to make your offering to, take a moment or two to calm yourself and get into the right frame of mind. This is always a good idea, for any kind of prayer or ceremony. After your prayer, it’s a good idea to spend some time in quiet contemplation and open yourself to any possible communication from the gods, spirits, and ancestors (or whoever it is you’re offering to). Some Gaelic Polytheists like to look for signs or omens about whether or not their offerings have been well-received. This isn’t necessary, but it is an example of one of the ways to be mindful about our practice; we shouldn’t just assume everything is fine and dandy. If, on the off-chance, you feel that your offering hasn’t been well-received, then it’s a good idea to think about why…. It could be that the being you’ve made your offering to doesn’t want to be bothered (in that case, take a hint). It could be that the offering you’ve made is unacceptable or not to their taste (in that case, try offering something else – trust your intuition on this one). It can be helpful to talk to other Gaelic Polytheists if you’re not sure what’s going on. However, always remember that what works for one person, or even a lot of people, that doesn’t mean it will automatically work for you. 1 Sometimes people ask if pouring alcohol down the sink is an acceptable alternative. Personally I wouldn’t, because you’re pouring an offering back into the water supply (see the part about toradh). When it comes to the issue of alcohol, this advice seems to provoke strong reactions from some people. But really it boils down to a matter of respect, a matter of good hospitality, and depending where you are in North America, it can be a matter of safety as well. I can’t claim to have direct experience of any of this, but I can promise you that I’ve spoken to people who do, and who know a lot more than I do on the matter. See Gaol Naofa’s article on Offerings in Gaelic Polytheism for more on this. 2 Throwing away your offerings isn’t ideal, though sometimes it may be necessary. If you absolutely have to throw an offering away then at the very least put it in its own bag, separate from your rubbish. 3 This is an original composition, but carries a number of elements from traditional prayers such as those found in the Carmina Gadelica, such as the opening and the couplet at the end of each verse. It could easily be simplified for very young children, or else be adapted to address particular deities (for example, Brigid, “A Bhrìghde”), or the gods in general (“A Dhiatha”), guardian spirits (“A Shail-Spioradan”) or spirits in general (“A Spioradain”), and ancestors (“A Shinnsirean”) in separate verses, which may be a bit too much of a mouthful for younger children but fine for older ones. Addressing each one separately could be a good exercise in encouraging mindfulness, especially.